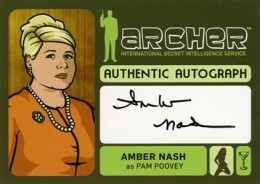 Traditionally autographed cards from animated shows and movies aren't received as well as their live-action counterparts. 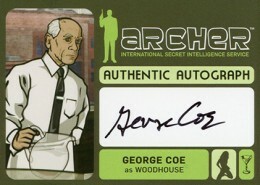 The 2014 Cryptozoic Archer Seasons 1-4 Autographs might change that. 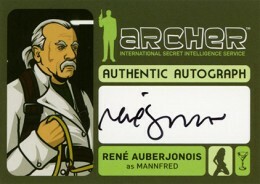 The set not only covers a big chunk of the show's main cast, but it has several first-time signers from other recognizable names. 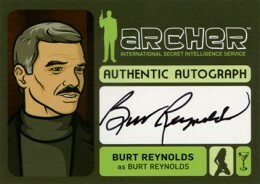 And let's not forget Burt Reynolds and his glorious 'stache. Even animated, it's a thing of beauty. 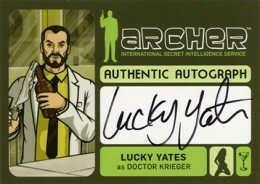 Autographs land 1:24 packs of 2014 Cryptozoic Archer Seasons 1-4, or one per box. 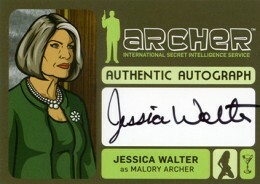 Among the show's regulars appearing in the set are Jessica Walter (Malory Archer), Amber Nash (Pam), Chris Parnell (Cyril) and Judy Greer (Cheryl). 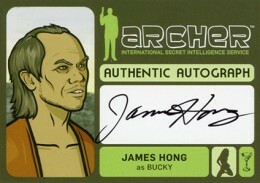 This marks the autographed card debuts of all four. 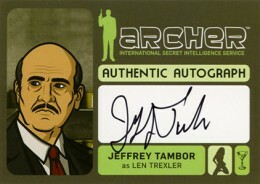 Unfortunately, H. Jon Benjamin (Sterling Archer) and Aisha Tyler (Lana) aren't on the checklist. 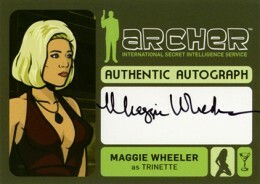 However, if you're looking for a signed card of Tyler, she does have one in 2006 Artbox 24 Season 4. 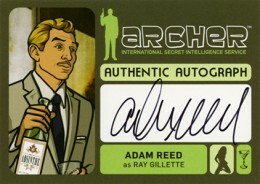 Leading the way for guest star signers is Burt Reynolds. Smokey and the Bandit, The Longest Yard, Boogies Nights -- the guy is a legend (even with a resume that includes Rent-a-Cop). 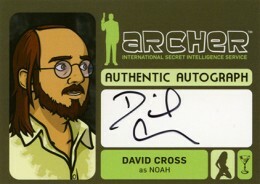 Fans of Arrested Development have a lot to dig into with the 2014 Cryptozoic Archer Seasons 1-4 Autographs. 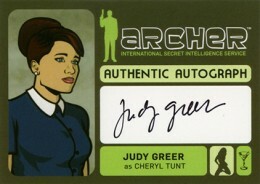 In addition to Walter and Greer, others who had key roles in the cult-favorite sitcom include Jeffrey Tambor and David Cross. 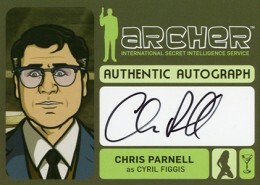 Want a particular card? 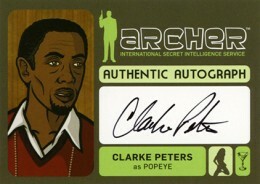 Click on the link or image to shop for singles on eBay.